"The groom carried a lightsabre at the altar..."
You can (or could) get married on the bridge of the Enterprise in Vegas if you wish (link). I'd insist on Elvis carrying out the ceremony though. If there was any chance of running into one of those Klingon chicks . . . I'd go. You don't really need to ask the question, do you. A bit of light entertainment perhaps, but possibly not representative of a lifetime commitment? 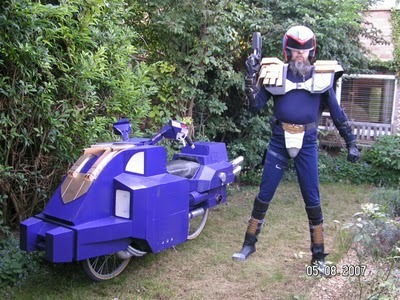 The 'Judge Dredd ' themed wedding organisers have fallen on hard times.. It's a toughie, but I'll go for 'crass shite'. Star wars/star trek (still not worked out the difference) geeks should be avoided. Brave of the bride to go as Jabba The Hutt. But srsly folks, I think these things are fine. Given how seriously most (nearly) people take their wedding vows I think you have to ask whether all this white dress (snigger) and promises before God stuff is really the tackier option. Ever noticed how disingenuous wedding vows in a church actually sound? Might as well have fun with it. In a wedding ceremony there is only one theme. Surely, the joy of a wedding ceremony comes from witnessing the serious commitment the couple make to each other in front of family, friends and the eyes of the law? A marriage can be difficult enough to maintain at the best of times, so the idea of starting it off in such farcical fashion should have alarm bells ringing, never mind church bells. Their immaturity shows how ill-prepared they are for the journey they are embarking on. Besides, the entire Star Wars saga is predicated on the catastrophic disintegration of the Skywalkers' marriage, not something I'd want my own marriage to draw inspiration from. I wonder what will the inevitable divorce look like? N to the A to the FF. Interesting comment. Many philosophers contend that life has become infantilised, through the influences of the mass media and popular culture. University of Wales Institute Cardiff now to offer courses on Star Wars and Harry Potter. My elder said recently that her ideal wedding would be on the Jolly Roger in Barbados. Everyone in swimmies, swinging off the rope into the sea, dancing on deck to the latest Cropover music. Not to mention rum punch on tap - mind you the JR rum punch is lethal. Just as well I've never nurtured fond dreams white church weddings. Totally agree - most of the News Feed from my friends is updates to World War, Farmville, Zoo stuff, Mafia wars etc. How much time do people have on their hands? Fellating Satan comes naturally to "Property Slebs".